ComScore has just released data showing that social networking websites still charge much less for digital advertising than traditional websites. This should come as no surprise. People find social networking addictive. They spend hours checking the latest updates on the Facebook wall. For many it is the first thing they check in the morning and the last thing they check at night. People find social networking unbelievably engaging. One can assume from this that the actual content must be pretty interesting. So why would anyone expect people to notice small ads on the side when the content in the middle is so damn good? The answer is simple – they shouldn’t. Social networking by its very nature is not as well suited to regular ads as traditional websites. What can your brand do about it? Don’t worry, there is some good news for your brand. Social networkers have shown a tremendous willingness to engage with brands through social platforms. Today, Starbucks is just short of 10 million fans (or ‘Likes’) on Facebook giving the company access to a huge pool of potential brand advocates. By engaging with these fans, Starbucks (or any other brand for that matter) has the chance to build brand loyalty with users in a much more meaningful way than is possible with regular ads. The idea of ‘engaging instead of broadcasting’ through social networks has become a cliché, but for good reason – it works. What do you think? Is your brand still relying on regular ads on Facebook? Self-professed social media gurus will be quick to tell you that brands need to engage with consumers online. Get on Twitter and Facebook and consumers will love you for it. However, before jumping in, brands need to ensure that they have the true commitment required or they may end up hurting their brand instead of helping it. Last week I wrote a post on Workopolis’ brand refresh. Someone from the PR firm reached out to me through Twitter asking if I would like to speak with someone from Workopolis about their brand. As well, a Workopolis employee commented on the post. My first instinct was they were doing a great job by reaching out and showing a willingness to engage in a dialogue with me about their brand. But I soon learned that the company lacked follow-through. I responded to both saying I would love to speak with someone further about the brand. It has been almost two weeks and I still have not heard back. I wasn’t expecting a response to the original blog post and was delighted when I received one. I was, however, expecting a response once they reached out to me and found myself disappointed. This goes to show both the potential and the danger of social media for brands. The commitment in terms of time and human resources are high, as are the risks. If a brand isn’t ready to use social media properly, they will continue to put themselves at a greater risk of harming their brand. A few months ago, Facebook separated your stream into the ‘Top News’ and ‘Most Recent’. Essentially, Facebook created an algorithm to try to show you only the most relevant items. For some users this was a big improvement, but for brands this has been detrimental. The beauty of social media to brands is the ability to quickly spread your brand name through existing social networks. If one of my friends became a fan of something on Facebook, that would appear in my news stream giving me to option of doing the same. This is how some brands rapidly grew the size of their Facebook pages. Unfortunately, these updates rarely get chosen by Facebook to be included in your Top News feed, instead being relegated to the Most Recent section which few people look at. Without the visibility of other users’ brand preference, brands are finding it much harder to spread across Facebook. Facebook’s recent announcement of their Social Graph across the web does a decent job of addressing this problem. Now whatever site I am looking at, they can show me which of my friends ‘like’ them and give me the option of ‘liking’ them without having to leave the webpage. This will reduce the friction faced by users, helping brands reach more potential fans. Unfortunately, even with more exposure, Facebook does not address the ability for a brand to spread through a social network. So brands will grow, but they will be much less likely to go ‘viral’. You can argue that this doesn’t matter for Facebook’s 400+million users and that is probably true. But those users aren’t paying to use Facebook. For the company to grow, they need to provide more value to brands that are going to be paying their bills for the foreseeable future. A good first step in making up lost ground, but Facebook still has some way to go in providing brands more value. What do you think? Does Facebook provide enough value and growth potential for brands? A recent article from BrandWeek says that branded apps are having more trouble gaining traction among users, looking mostly at iPhone apps. It is becoming increasingly difficult to reach Apple’s list of the top 100 apps, a common benchmark for success in this space. If history is any indication, this shouldn’t come as a surprise to brand marketers. Many new categories are founded by small, nimble companies that can quickly meet an emerging consumer need. Initially, the early adopters will jump on the new services but as the market grows it will inevitably become more difficult to stand out. The bar quickly gets raised for brands trying to differentiate themselves. While this may frustrate some brands, it is music to the ears of consumers. The novelty of mobile phone apps is wearing off and users are looking for services that add real value. Brands will be forced to provide consumers with increasingly useful products. Another example of this can be seen in Facebook groups and fan pages. Only a few years ago it was the norm for Facebook users to join almost any group they were invited too but any interest in a given group page rarely lasted more than a week. Today, users are more discerning in what groups they will join, focusing on the groups that are of significant interest to them and can provide users with actual value. It is exactly the same thing with iPhone apps today (although some Facebook apps are still around that should have disappeared long ago!). Once a brand has proven the capability of making a useful app, they will be able to leverage their brand and attract users to new apps more easily – a simple brand extension. However, brand extensions are most successful when done from a strong core brand. For now, they should focus on branded apps that create exception value in order to develop the strong core brand they need. What do you think? Will mobile phone users be more selective of their branded apps? Does Facebook Know Their Brand? Facebook, the social networking giant, is seen as one of the strongest brands in the digital space, and arguably one of the strongest out there at all. But does Facebook truly understand what their brand offers to consumers? 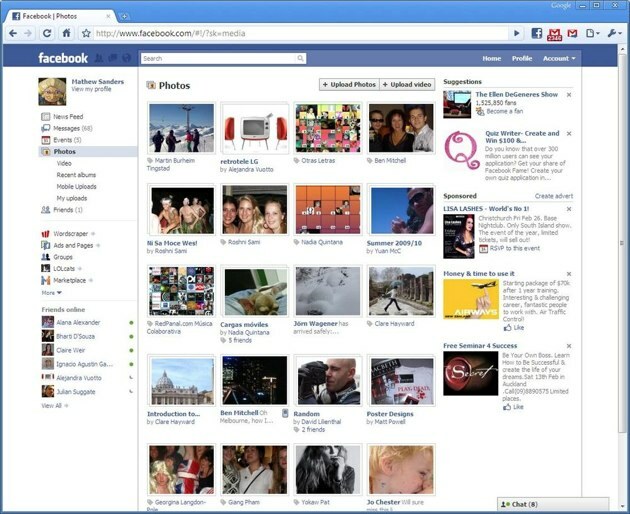 Facebook, which just celebrated its 6th birthday by passing 400 million users, has released images of a new site redesign (see below). This is a relatively common occurrence for social media sites that are constantly adding new features as the underlying technology increases in sophistication. While it is commendable to update and improve your product, Facebook’s latest redesign shows that they might be confused on what their brand offers. The most noticeable change is the new emphasis on search. This reminds of their recent addition of the ‘@’ feature commonly used on Twitter. I am sure that many people appreciate these new features, but it shows that the brand is lacking a clear value proposition and trying to be all things to all people. Is Facebook about search? Networking? Photo sharing? Don’t get me wrong. Facebook is a great brand with a lot to offer but if they are going to continue adding and engaging users at the blistering pace they did in 2009, they will need to clearly define their focus and communicate that to consumers. What do you think? Does Facebook lack brand focus? Roughly speaking, the benefits that a brand offers its consumer can be divided into two groups: functional benefits and emotional benefits. Functional benefits can be very powerful but can more easily be duplicated by competitors. It is in emotional benefits that brands are able to create more meaningful, lasting relationships with their customers. While the reward of strong emotional benefits is great (more loyal customers, lower marketing costs, etc), the difficulty in occupying this brand space is significant as well. The rise of social media and the increasing sophistication of its use by brands large and small has created a new and exciting way of providing emotional benefits to consumers. Social media is inherently about emotional benefits: belonging, friendship, interaction, teamwork, status, etc. By using social media, brands can tap into these powerful emotions and create lasting relationships with consumers – as long as it is done correctly. The key to creating emotional benefits on social media is to focus on the benefits that are inherent to social media. If a brand were to focus on the emotional benefit of security, there would be no fit with the existing emotions at play in social networks. By focusing on interaction, consumers are able to gain the emotional benefit and do so while collaborating with the brand. Two examples of this jump to my mind: DEWmocracy by Mountain Dew and Facebook flavoured Vitamin Water. In both cases, the companies have emphasized interaction and teamwork among the brand and its consumers in order to develop a new product. Consumers who have helped in the process will feel an instant emotional connection to the brand that they helped to create and everyone else will associate the brand with the emotional benefits. What do you think? Have you seen other examples of leveraging social media to provide emotional brand benefits?